Darwin Digital designs user interfaces for websites, application administration portals and mobile applications. 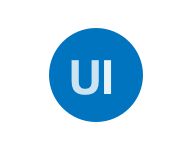 Good UI design is a fundamental part of building an intuitive and user-friendly Graphic User Interface (GUI). Most mobile applications are designed in a way that the user needs to complete a set tasks in a specific order, while most website are content rich and are meant to inform the user before encouraging them to complete a call-to-action. Darwin Digital regularly designs and develops web portals for users to interact and administer web/cloud applications. We ensure the user-interface design of these portals remain intuitive and simply in order for the user to find and complete tasks with as little fuss as possible. It is also for this reason that the designer will create and visualise an interface that meets the customer needs and via this; maximising the user usability. Investing in good UI web design will save your company time and money in the long run and will not frustrate your employees.